Earlier this month I celebrated my 35th birthday, which coincided with a return to my native Midwest after many years away. I reconnected with many friends – some whom I have known for over 20 years since we were fresh-faced (or pimple-faced!) high school freshmen. We shared highlights of our lives: marriages, children’s births, graduate studies, job promotions, travels, and other joys. In each of these conversations, there was also the acknowledgment of wounds – miscarriages, divorce, untimely deaths of loved ones, depression, medical diagnoses, and job losses. You don’t get to 35 without wounds of one kind or another. In our conversations on post-high school/post-college “real world” lives, there were both joys and wounds to name. “Blessing” and “blood” share the same Germanic/Old English root which etymologists speculate reflect the ancient practice of consecrating a place or a thing with the use of blood. Think of the marking of the lintels with lamb’s blood in Exodus, or Christian language of being “washed in the blood of the lamb.” While the word “blessing” has been sanitized and prettied-up by Hallmark cards or Christian bookstore merchandise, the etymological connection between “blessing” and “blood” remind us of an uncomfortable truth: blessings aren’t all warm and fuzzy. Encounters with the Holy might change us in difficult – even wounding – ways. This truth is reflected throughout scripture – from Jacob/Israel wrestling with God in Genesis to Zacharias being struck dumb in Luke to Saul/Paul being blinded in Acts. This truth is reflected in our own lived experience – as I clearly saw in the faith journeys of my age peers. To talk about the role of God in human suffering is a tremendously tricky enterprise. 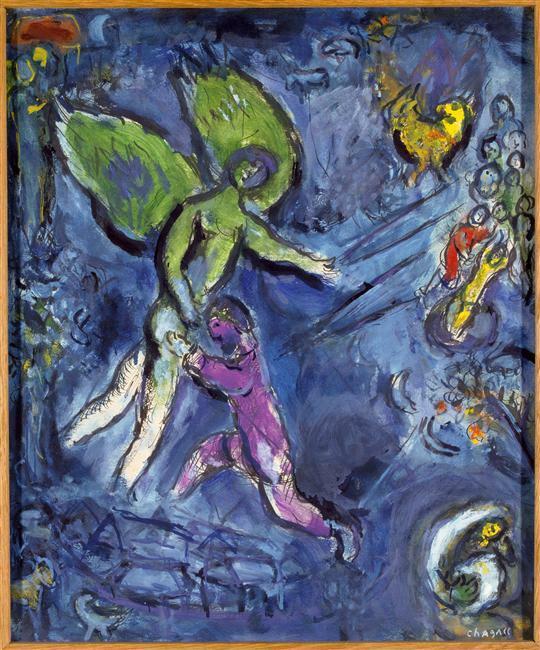 The question of theodicy – why an all-good, all-powerful God allows suffering and injustice – is one humans have been wrestling with at least since the Book of Job, the oldest text in the Hebrew Scriptures. Feminist and other liberation theologians correctly point out (two excellent works on this theme: Barbara Reid, OP, Taking Up the Cross: New Testament Interpretations through Latina and Feminist Eyes, Rita Nakashima Brock and Rebecca Ann Parker Proverbs of Ashes: Violence, Redemption, and the Search for What Saves Us) that any theology that blames the victim, idealizes or valorizes suffering, is bad theology which is dissonant with our inherent human dignity and call to abundant life (Jn 10:10). Far too often in history Christian scriptures have been misused to perpetuate abuse and injustice, and victims counseled to “offer it up” or “bear their cross like Jesus.” Far too often in history humans have constructed God in the image of our own lower selves: vindictive, angry, punishing. Aware of that history, I still dare to say that there is something deeply true about the connection between blood and blessing, between God-encounter and wounding. It is true but not adequate to say God is love. Both Scripture and lived experience reveal that the spiritual life is not sunshine, lollipops and rainbows. We risk our God image turning into something like the movie Dogma’s “Buddy Christ” if our spirituality is not capacious enough for the mysterium tremendum et fascinans, before which Job kept awe-filled, humble silence (Job 40:5) in the face of God’s powerful self-revelation. 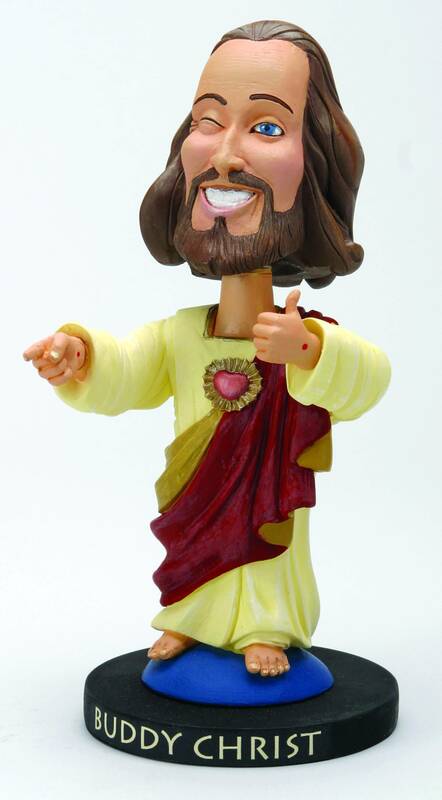 “Buddy Christ” from the film Dogma (Lionsgate, 1999). The challenge is to find God through and in – not in spite of – life’s inevitable wounds. 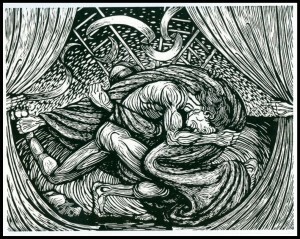 Like Jacob who became Israel through his long night of wrestling with God’s angel, we become authentically adult Christians through our wrestling with the unique circumstances of our own lives. While others can offer accompaniment, solidarity, and encouragement, the wrestling – and the blessing which is born of it – is uniquely our own. We stay in the long, uncomfortable Good Friday and Holy Saturday instead of trying to rush ahead to Resurrection Sunday, trusting transformation comes according to God’s time and not our own. With the psalmist, we pray for God’s tender mercies (Psalm 25:6), knowing that not all mercies are tender. Celebrating the gift of 35 of my own life – and the lives of friends with whom I’ve reunited over the summer – I give thanks for all the blessings, even those that came in and through wounds. In offering me, “Que Dieu te blesse” instead of “Que Dieu te bénisse,” Catherine didn’t realize that her simple French mistake was in fact a prophetic statement about how wounds and blessings are intertwined, how God is found in and through the struggle. Her simple French mistake spoke to the roads that we have walked as Christian women through our 20s and 30s. Job declared, “The LORD gives, and the LORD takes away. Blessed be the LORD!” More recently, in Giovanni’s Room, the African-American writer James Baldwin echoed Job’s sentiment this way: “People can’t, unhappily, invent their mooring posts, their lovers and their friends, any more than they can invent their parents. Life gives these and also takes them away and the great difficulty is to say Yes to life.” Birthdays are a time to celebrate and reaffirm our Yes to life – and to all life’s blessings – even those that come through struggle. With Jacob/Israel, we bear the scars of our wounds as marks of our intimacy with and transformation by our Creator. With Jacob/Israel, we affirm that struggle with God is an inherent part of being God’s beloved. About the author: Rhonda Miska (rhonda.youngadultcatholics@gmail.com) is a former Jesuit Volunteer (Nicaragua, 2002-2004) and a graduate of the Boston College School of Theology and Ministry. Her past ministries include accompaniment of the Spanish-speaking immigrant community, Muslim-Christian dialogue, social justice education, direct outreach to people who are homeless, congregation-based community organizing, and coordination of a community with adults with intellectual disabilities. 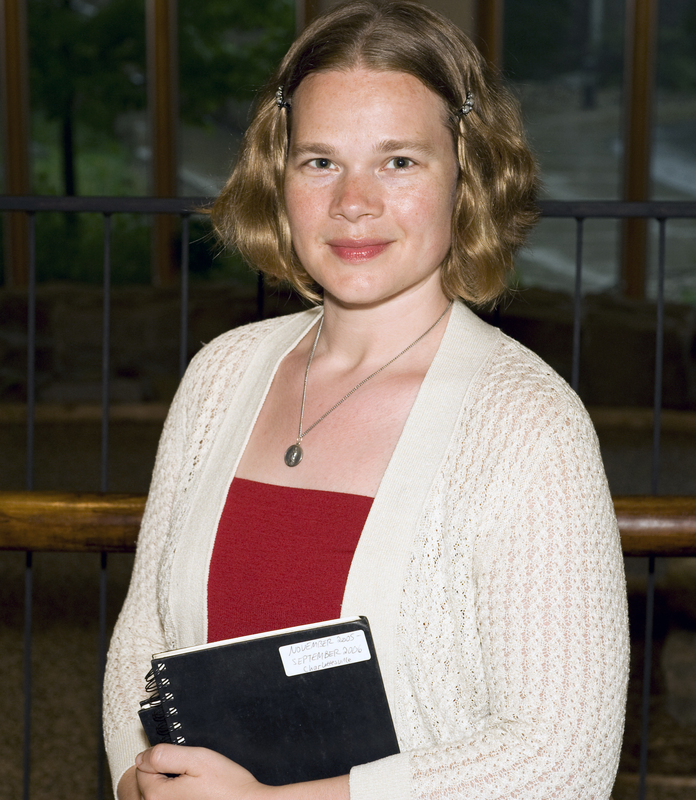 She currently serves as Coordinator of Programming/Development at Shalom Spirituality Center in Dubuque, IA. Her writing has appeared in appeared in various print and online publications and she is a contributor to Catholic Women Speak: Bringing Our Gifts to the Table which will be published by Paulist Press in September. This entry was posted in Spirituality by Rhonda Miska. Bookmark the permalink. Rhonda, receiving your post in my inbox was so timely because I am about to turn 35 in just a few hours. Thank you for this very soulful food for thought–I think someone up there wanted me to pay attention to this and chew on it! –Jen G.
Thank you, Jen! Happy birthday! Just ordered the two books– thanks Rhonda! In the Facebook age of “everything’s awesome, my kids are gorgeous and smiling, I just made really good rice,” this is an important and grounding message! Thanks Jennifer – I didn’t think of this as a alternative truth-telling in the age of “fake-book” but I appreciate that frame.